UE manufactures harsh and hazardous location instrumentation specifically designed for the demands of chemical processing and petro-chemical refining. With more than 80 years of experience, you can rely on UE to deliver the best pressure and temperature measuring, monitoring and switching devices on-time and with the high quality you expect. Our application engineers work hard to understand your application challenges, ready to help you select the most reliable and suitable products for protecting people, plant and process, all critical to your success. You can also use our Product Selector as a guide to help you select from UE’s wide variety of pressure and temperature monitoring products. The chemical industry is at the heart of manufacturing. It converts animal, vegetable and mineral raw materials into a host of products for use by both industrial and household consumers. Lightweight and durable plastic materials help fuel efficiency in transport; insulation materials save energy in buildings; paints protect and extend the life of metal and timber; soap, shampoos and detergents keep us clean; disinfectants and pharmaceuticals safeguard our health. Computers and telecommunications systems could not function without essential chemicals. The industry grew up using locally occurring resources such as salt, coal, limestone, vegetable matter and animal fats. Today, it is part of a global industry primarily using natural gas and oil fractions such as naphtha as its dominant raw materials. There is a keen awareness of the need to replace fossil resources with sustainable alternatives both as raw materials and for process energy. This industry manufactures petro-chemicals, which are chemicals derived from petroleum and natural gas (organic compounds that are not burned as fuel). Key products include ethylene, propylene, butylene, benzene, toluene, styrene, xylene, ethyl benzene and cumene. These products are basic building blocks used in the production of consumer products, automotive components and various durable and non-durable goods. Organic compounds like ethyl alcohol and inorganic chemicals like carbon black are not included in this industry. Olefins and aromatics are the building-blocks for a wide range of materials such as solvents, detergents, and adhesives. Olefins are the basis for polymers and oligomers used in plastics, resins, fibers, elastomers, lubricants, and gels. Whether it’s protecting valuable equipment, processes or employees, creating a safe work environment is a corporate responsibility. UE’s One Series Safety Transmitters for pressure and temperature monitoring come with complete Failure Modes, Effects and Diagnostics Analysis (FMEDA) data from exida, enabling plant safety personnel to reliably calculate Safety Integrity Levels (SIL). The rugged One Series Safety Transmitter is installed in the field, at the point of critical monitoring, with response times <100 mS, providing fast alarm or emergency shutdown, while streamlining wiring and software. For your plant safety requirements, simplify and improve reliability with the One Series Safety Transmitter for all safety instrumented systems applications. The rugged and reliable One Series Safety Transmitter protects equipment, processes and personnel. It is installed where needed, in the field, with industry standard 4-20 mA output and direct-acting safety relay for alarm and shutdown functions. With 0.1% repeatability combined with solid-state reliability and on-board diagnostics, the One Series Safety Transmitter is the clear choice for critical plant safety applications. Plant safety requires immediate response to dangerous conditions. 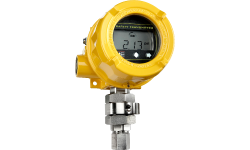 The One Series Safety Transmitter response time is <100 mS, many times faster than a typical process transmitter. And, with direct switching capability at the point of critical conditions, it provides technology that is diverse and ideal for SIS applications requiring redundancy, reducing the possibility of “Common Mode Failures”. The One Series Safety Transmitter continually checks its own health status for circuit and sensor integrity, providing extra assurance that it is available when needed. Using UE’s IAW (I Am Working) extensive diagnostics, the One Series Safety Transmitter provides SRO Status and IAW outputs that can be used as inputs to a safety PLC for voting logic and for making critical and instantaneous safety action decisions. Request the exida Failure Modes, Effects, Diagnostices Analysis report from UE covering the One Series Safety Transmitter, enabling you to calculate the Safety Integrity Level (SIL) for your applications. Also request the Safety Manual and Installation and Maintenance manual. 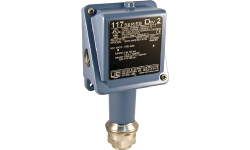 A pressure or temperature monitoring transmitter switch that provides a NAMUR NE 43 standard 4-20 mA analog output. 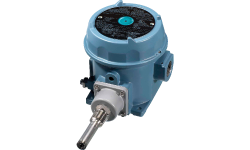 12 Series hazardous location switches are ideal for operation in tough applications where space is at a premium.